I think it is an angel wing begonia. Thank you Judy. Someone gave it to me, with no information. 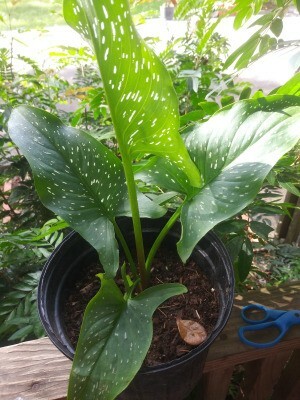 I think it is a Calla lily, scientific name : zantedeschia maculata (maculata because of the white spots on the leaves). The flowers can be white or red or pink or others fancy colors. I agree with the calla lily, specifically the White Spotted Calla Lily. People love these flowers for wedding bouquets!! I hope yours will flower nicely!